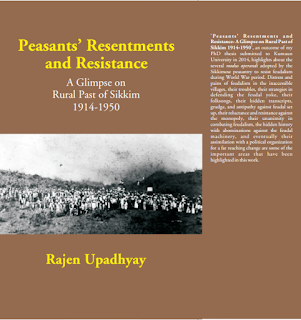 'Peasants' Resentments and Resistance- A Glimpse on Rural Past of Sikkim 1914-1950', an outcome of my PhD thesis submitted to Kumaun University in 2014, highlights about the several modus operandi adopted by the Sikkimese peasantry to resist feudalism during World War period. Distress and pains of feudalism in the inaccessible villages, their troubles, their strategies in defending the feudal yoke, their folksongs, their hidden transcripts, grudge, and antipathy against feudal set up, their reluctance and resistance against the monopoly, their unanimity in combating feudalism, the hidden history with abominations against the feudal machinery, and eventually their assimilation with a political organization for a far reaching change are some of the important areas that have been highlighted in this work. 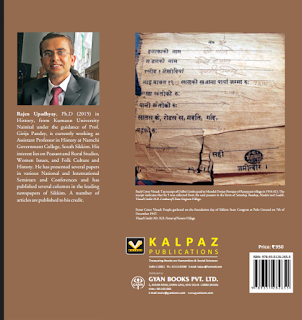 Rajen Upadhyay, Ph.D (2015) in History, from Kumaun University Nainital under the guidance of Prof. Girija Pandey, is currently working as Assistant Professor in History at Namchi Government College, South Sikkim. His interest lies on Peasant and Rural Studies, Women Issues, and Folk Culture and History. He has presented several papers in various National and International Seminars and Conferences and has published several columns in the leading newspapers of Sikkim. A number of articles are published to his credit. • Origin of Name • The People • Culture • Topography • Climate • Flora and Fauna • Forest • Minerals • Industries • Trade • Agricultural Production • Administration • Geo-Politics • Peasants’ Resentments and Resistance (1914- 1950) • Methodology • Notes. 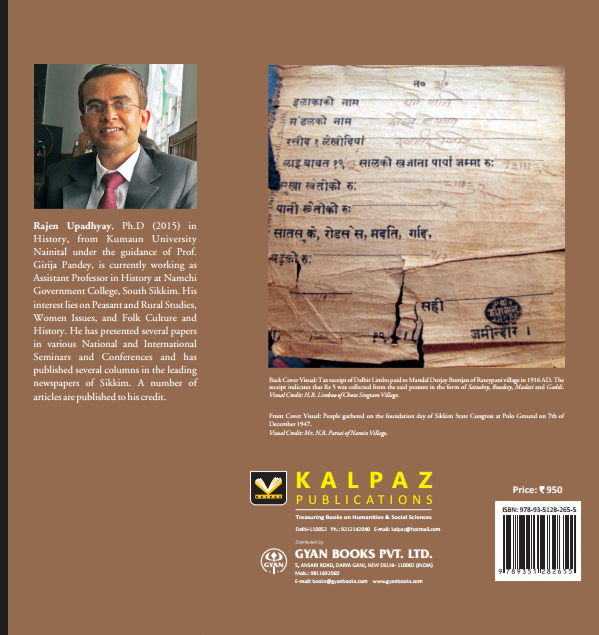 • The Namgyals • Foundation of the Kingdom of Sikkim • The War of Succession and the Bhutanese Incursion • Commencement of Tibetan Regency • Usurpation and Appointment of Rabden Sarpa as Regent • The Gorkha Invasion • Anglo- Sikkim Relations and the Kotapa Affair • Notes. • Commencement of the Nepalese Settlement • An Uneasy Era (1874-1914) • Period of Reformation • Peasant Resistance and Democratic Aspirations • Last Phase of Peasant Agitation and the Take Over • Notes. • The British Idée Fixe • New Mode of Revenue Assessment • Classification of Land and Ownership • The Intermediaries • Types of Tenancy in Sikkim during Early Twentieth Century • Adhiadars/Adhiars • Kutdar/ Kutiyars • Chakhureys and Pakhureys • Notes. • Jharlangi • Theki-Bethi • Kuruwa. • Hidden Transcripts in the Nepali Folksongs • Hidden Transcript in Spirit Possession • Anonymous Threats as Hidden Transcript • Hidden Transcript of the Peasants in Channel Breaking Activities • Hidden Transcript in Crop Destruction • Hidden Transcripts in Other Forms. 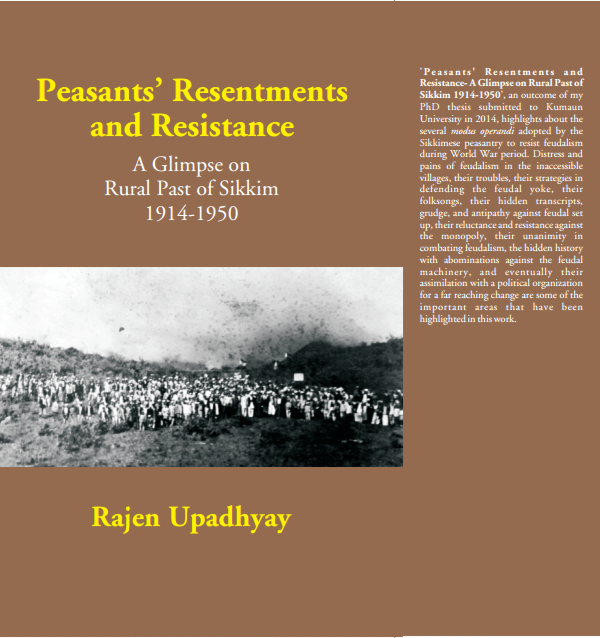 • Major Causes of Peasant Disappointment in Feudal Sikkim • Mode of Resistance against the Forced Labours • Resistance through Tax Evasion • Peasant Resistance in Sikkim through Poaching • Resistance through Bribe and Sexual Temptation • Notes. • Expansion of Individual Resistance into Rural Secret Societies • Birth of Rural Secret Societies • The Danthey Party • The Members’ Party • Tendong Secret Meet • Growth of Descent Societies- Pre-Sikkim State Congress Associations • Notes. • Foundation of Sikkim State Congress • Establishment of Sikkim National Party • The First Annual Conference of Sikkim State Congress (February 1949) • Peasant Demonstration at Gangtok on 1st May 1949 • Redress of Demands by the State through Sikkim State Congress • Notes. • Casualness of the State Congress towards the Rural Issues • Corruption and Neglected Condition of the Peasants • Notes.